Learn how to build trusted B2B relationships and grow sales. Public and Private courses available. Developed by Keith Dugdale and David Lambert, ENGAGE B2B Sales Training is based on their proven approach of providing value in every interaction. It has now been delivered to more than 10,000 people who are responsible for business-to-business sales around the world in both public and in-house workshops – from consultants and small business owners to employees and leaders of Fortune 500 firms. Minter Ellison Rudd Watts, Australia and New Zealand. The aim of ENGAGE is to increase the skills and confidence of individuals and teams, from all levels within your organisation, to be able to build trust with economic buyers, leading to more profitable work with the clients you most want to work with. An additional outcome is that attendees will develop a specific action plan for growing or developing the relationship they have with either a new prospect or existing client. Who and how many should attend? The ENGAGE program is for anyone who works in a B2B or professional services environment and wants to improve the way they engage with clients and prospective clients, to build more trust, and more easily make sales. The program will benefit those who have many years experience and are looking for some new tools for their toolkit, right through to people who are new to sales and client relationships, or are just starting out in their careers. If you are planning to send a group from your organisation, from our experience, the training works best if there is some depth in the attendees (both senior and junior staff), and that they are from different parts of the business. We find this helps with the embedding as a greater cross-section of people understand the intent of the sales approach. One approach we find particularly effective is to structure your attendance around key client teams, so that the team works together across the two days on the client as a whole, with each taking responsibility for different key contacts to strengthen their relationship with. As the training is very interactive, we recommend having 12-16 people per program in order to ensure everyone gets time to participate fully, and has the opportunity for some one-on-one coaching from the facilitator. Create environments in which people buy (and they don’t have to sell). Be sought out as a business advisor beyond just their own technical expertise. Get even more repeat business. Day 1 is primarily focused on teaching, Day 2 is primarily focused on putting it all into practice. This practical component is critical in giving you the opportunity and the confidence to try it out in the ‘real world’. 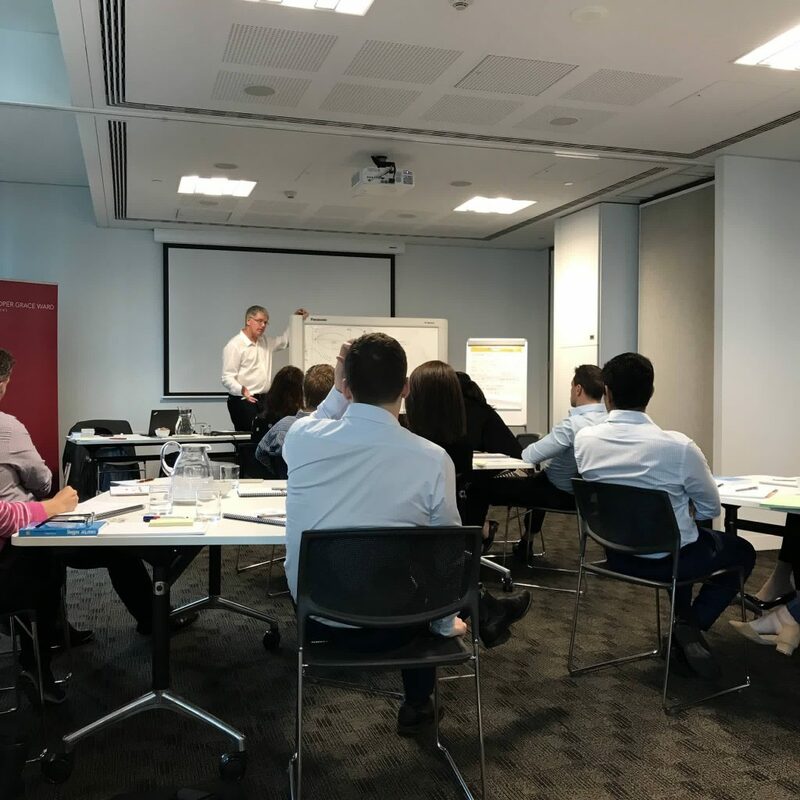 The ENGAGE workshop is highly interactive, involving a lot of hands-on workshopping and providing practical tools and techniques that can be implemented straight away. At the end of the two days you’ll have developed a relationship plan for a current or desired client, as well as having a personal development plan focused on the most important things you need to work on to become a trusted business partner (or to further strengthen the partner relationships they already have). What behaviours build trust and rapport in sales conversations….and how to avoid those that do not. How to identify the right person to talk to in any organisation, and build the confidence to talk to people higher up the client hierarchy. How to identify the four common types of business relationships, and how you can create the right relationships with the right people. How to write engaging emails/make engaging phone calls that make senior decision makers want to meet you. How to ask questions and deliver value in every conversation to engage your clients/ prospects, build trust and win work…profitably and quickly, without any hard sell. The skill of ‘selling’ their ideas and services in an engaging way. How to have broad and deep conversations outside of their area of expertise, which lowers self-orientation and fosters trust. How to follow up meetings in a way that continues to build the relationship. How to feel confident about bid go/no go decisions. How to adapt the ENGAGE tools to any sales situation including presentations, pitches and bids. Day 1 Your personal challenges in ‘selling’. Understanding the different types of client relationships, and assessing your current relationships. Understanding the different buying criteria and who you should be targeting and why. Understanding your own behaviours and the behaviours of others so you can adapt to build rapport. How to get meetings that decision makers want to come to, and open meetings in an engaging way. How to ask questions that build trust quickly. Day 2 Practicing asking questions to build trust. How to ask strategic, broad ranging questions that position you as a trusted advisor. Facilitating a meeting/capturing meeting content, and how to use this technique for presentations and pitching. Preparing questions for a real client meeting. How to ‘sell’ ideas in an engaging way through benefits and stories. Practicing opening meetings in stressful situations. How to follow up meetings in an engaging way that continues the relationship. Bringing all the skills together in a practical way. While ENGAGE is based on a set structure, the facilitator will adapt the sequence and content throughout the workshop depending on the needs of the attendees. For private courses run internally within organisations, the workshop branding and case studies used within the training can be customised. The ENGAGE training program is run by one of The Business of Trust team, or one of our accredited trainers. You can meet the team here. Read some feedback from past participants of the ENGAGE training program on our Testimonials page. For more information on running the ENGAGE B2B Sales Training program in your organisation, please contact us. To find out about any upcoming public training programs, please check out our events page, or contact us to be added to our notifications list.